Sustainability, using less plastic, and recycling are currently high on the fruit and vegetable sector's agenda. 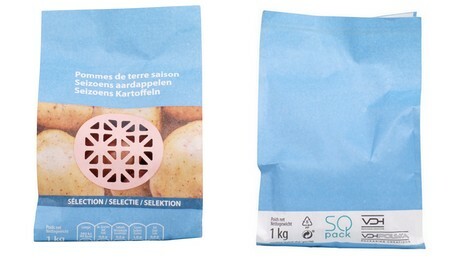 VDH Concept has been supplying organic packaging to Belgian retailers for more than 12 years now. “Sustainability has never been a bigger issue than now. We have been supplying packaging made from recycled plastic for years now," says Jan Lode van den Heuvel of VDH Concept. "This was, however, never communicated to the consumer. At the moment, this is very important. In order to respond to this, we have developed new organic packaging for the fresh sector." "One of our major firsts is the manufacturing of personalized, perforated windows in the packaging. With our perforations, you can create the same window effect as with a net. However, with this method, the single film packaging is completely recyclable. Packaging with a net window is not," Jan Lode says. "The perforations air the product. This type of packaging also runs through the packaging machine much faster than packaging with a net. We built the packaging machine ourselves in Poland. This means our perforated films are unique. Any design or logo can be printed on the perforated film too. It can also be used in any format of packaging, film, or paper." VDH Concept is also busy introducing the 'I’m Green' film to the potato sector. "The I’m Green film is no longer made from oil. It is produced with up to 85% sugar cane and is, therefore, 100% recyclable. This is not a new type of film. However, in the potato sector, you hardly ever see packaging made from this type of film. Yet, I have noticed that the sector is changing. It has to, when the media and end user more or less demands it," continues van den Heuvel. “Technically-speaking, there is no difference between LDP and the I’m Green film. This is a good thing for the packers. The packers do not have to adjust their machines. They can make any packaging they want from it. The 'I’m Green' film is slightly more expensive, but this kind of packaging is the future." Doypack packaging can be manufactured using I’m Green film. "Price-wise, it is much cheaper than laminated film. You also have the same upright packaging, but it is entirely recyclable. This is available on a roll as well as pre-formed." “We are also developing paper variants of plastic packaging. This kind of packaging can be thrown into the paper and carton bin in the Netherlands and Belgium. This paper SQPack is less expensive than comparable paper sheets with a PE layer to seal it. This is because only one material is used. It has an organic inner coating, making it completely recyclable," explains Jan Lode. "This type of packaging also runs through the packaging machines quickly. It can be supplied on the roll or pre-formed. With this packaging, packers can do just about anything; there are endless possibilities." SQpack is VDH concept's brand name for all their packaging with personalized, perforated windows as well as all types of packaging. 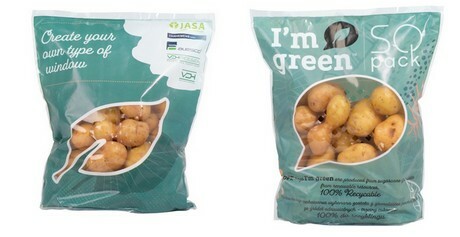 The JASA packing machine manufacturer from the Dutch town of Alkmaar has a world first. This patented machine has been nominated for the Packaging Award 2019. The 'Bag2paper' (the packaging's brand name) comes in rolls of perforated paper. VDH supplies this product in varying qualities.